COLOR(S): White; White with black or tan markings; may be tri-color. The Parson Russell Terrier, originated in 19th century England, this dog breed was formally known as the Jack Russell Terrier. The Parson Russell Terrier was used to hunt mostly fox. 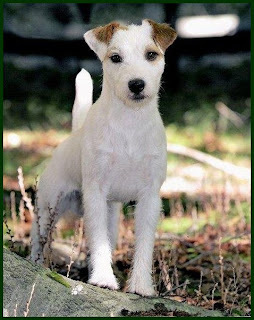 The Parson Russell Terrier is squarely built, alert, active, and self-contained. The Parson Russell Terrier is intensely energetic, spirited, and demanding that’s why it is not recommended for the first time dog owners. They can be destructive if bored. They do best in a home with older considerate children. The Parson Russell Terrier has two varieties of coat: Broken and Smooth. Either coat is a double coat that is harsh, close, dense, glossy, and straight. This breed sheds little to no hair. The Parson Russell Terrier is intelligent and obedient. However, they are determined and willful. Early intense socialization and obedience training is necessary for this breed of dogs. They require exercise. They do not do well in apartment style living however, they enjoy to roam about in a securely fenced yard. Regular brushing and combing is recommended. Bathing should only be done when necessary. Professional stripping of the coat is required twice a year for this breed of dogs. Like other dog breeds the Parson Russell Terrier's are also prone to some health issues and diseases. The specific health concerns and diseases that affect this dog breed are Legg-Perthes, eye disease, and deafness.